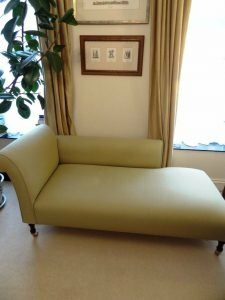 A vintage low back left hand chaise lounge sofa on brass castors, upholstered in cream fabric. 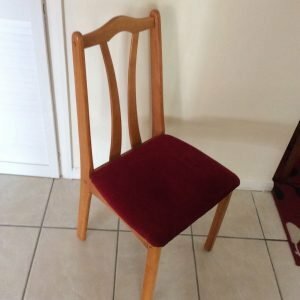 A vintage solid pine high back bedroom dresser chair, upholstered to the seat in red velour. 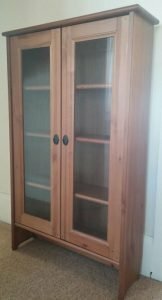 A tall standing solid pine double display unit, having two glass inlaid doors opening to reveal three shelves. 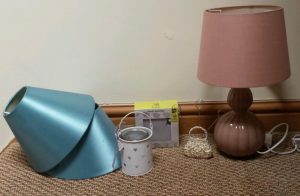 A small collection of home accessories, to include a large table lamp, two blue lampshades, a candle holder etc. 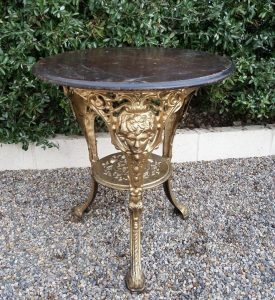 A vintage heavy brass art nouveau three legged dining table, having a circular black marble table top. 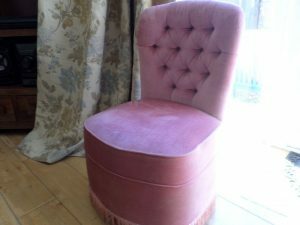 A vintage high back dresser chair, upholstered in pink velour with button back detailing and fringing. 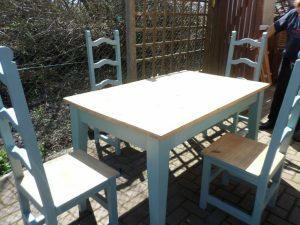 A solid pine hand painted rectangular dining table, together with four high back dining chairs. 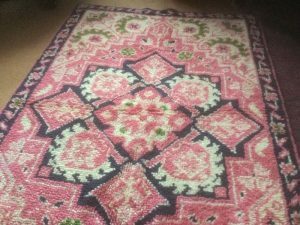 A large vintage woollen pink and white patterned rectangular area rug. 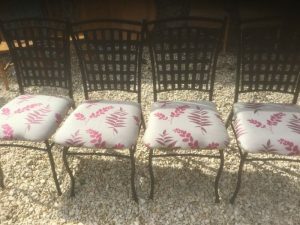 A set of four high back cast iron dining chairs, upholstered to the seats in pink leaf patterned fabric. 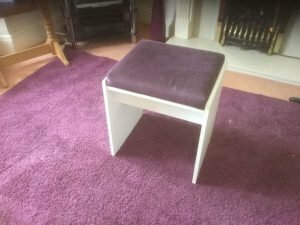 A white solid wood square dresser stool, upholstered to the seat in purple velour, together with a large purple woollen area rug. 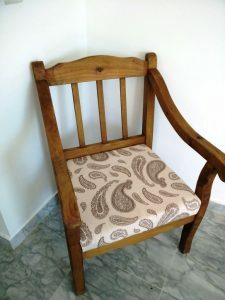 A vintage solid oak square backed armchair, upholstered to the seat in Indian style fabric. 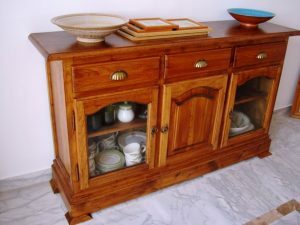 A large solid wood sideboard, having three brass handled drawers above three cupboards. 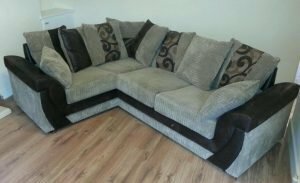 A four seater low back left hand corner sofa, upholstered in black suede and grey velour. 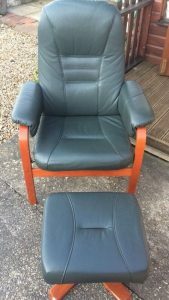 A vintage solid wood high back armchair and matching footstool, upholstered in green leather. 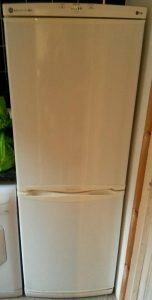 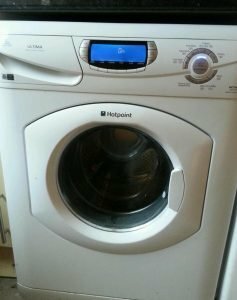 A white Hotpoint under counter 9kg 1400 spin washing machine with a digital display. 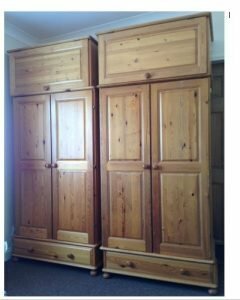 A pair of tall standing solid pine double wardrobes, each having a cupboard to the top and a drawer to the bottom. 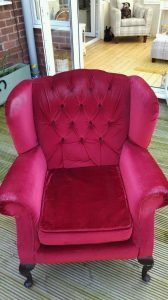 A vintage wing back Queen Anne armchair on mahogany legs, upholstered in fuchsia velour. 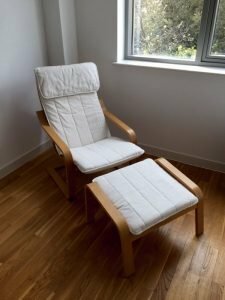 A solid pine high back fold down armchair and matching footstool, upholstered in white fabric. 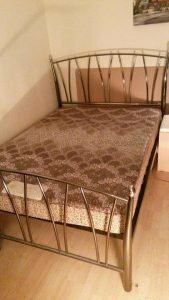 A chrome arched double bed frame, together with a damask patterned double mattress.